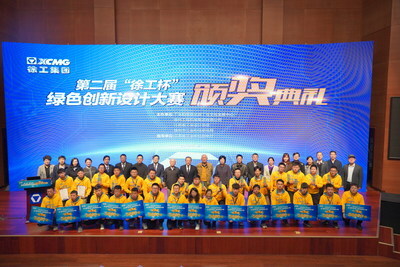 XUZHOU, China, March 26, 2019 /PRNewswire/ -- Hosted by China's leading construction machinery manufacturer XCMG, the second XCMG Cup Green Innovation Design Competition has revealed this year's winners at an award ceremony in Xuzhou, China. A team led by Gao Shuai from Yanshan University won first prize with their solution for the R&D of hoisting and excavating machines, specifically high-efficacy solutions for aerial mounting of an impeller fan assembly. The second XCMG Cup received 200 projects from 800 contestants who come from eight countries and regions including Mainland China, Macau, Canada, Brazil, the Czech Republic, Turkey, Bangladesh and Russia. In addition to financial awards, the first- and second-place winners will have the opportunity to study at XCMG's overseas offices in Europe and the Red Dot Design Museum. Winners who meet the basic requirements may also receive job offers at XCMG. The projects can also be submitted to the China Good Design and Red Star Design awards.